Benefits. Payroll. HR. All online, all in one place—free. Already have payroll or benefits? Connect them with Zenefits in seconds. Need benefits or payroll? We'll give you quotes and set you up. You and your employees get free access to our in-house insurance, payroll, and HR specialists. Call or email any time. No problem is too big, no question is too small. HR management service Zenefits launched a new performance tracking tool for employees, which has been built in-house as it looks to pick off niches on its effort to become a one-stop shop for HR in small businesses. 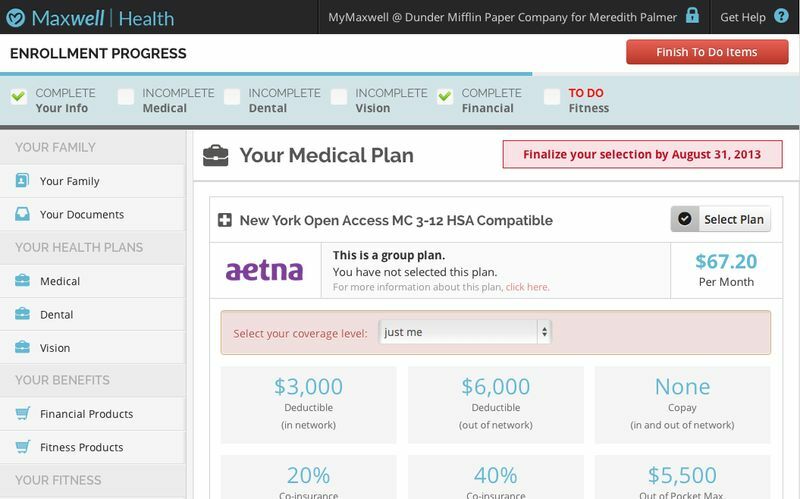 That includes reviews, goals, and will eventually also incorporate check-ins and peer reviews. At smaller companies, these may often seem to be oversights or afterthoughts, but Zenefits seems to want to streamline the process and introduce these kinds of sophisticated corporate behaviors into smaller businesses. 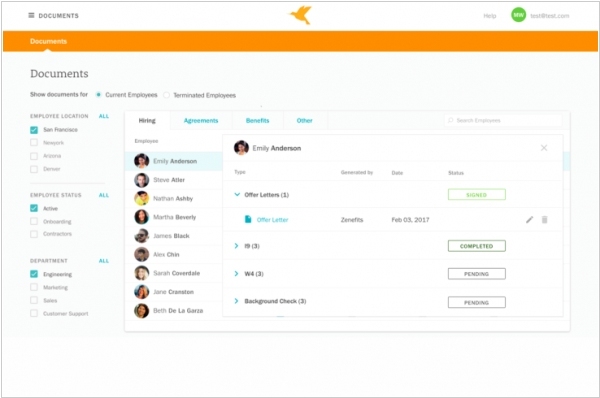 Human resources management service Zenefits released a suite of new updates that revolve around trying to simplify the process of managing an employee base, from benefits to payroll, to something as simple as a few taps on an app. Right now, they’ve worked on tools like time-off requests and clocking in and out, but it seems clear that as it tries to recoup the good will it lost amid a major compliance scandal that effectively halved its valuation Zenefits is trying to methodically make its way back into the small- to medium-sized business mindshare with a simpler product than a complex desktop-based dashboard. Zenefits is also adding reporting and analytics for HR managers so they can construct reports on their businesses’ employee activity. One example use case of such a business intelligence function would be helping HR managers get better snapshots of data simply for presentations to their bosses. HRM service Zenefits adds new tools for HR managers to ensure that employees are getting their documents in and they are compliant with regulations. 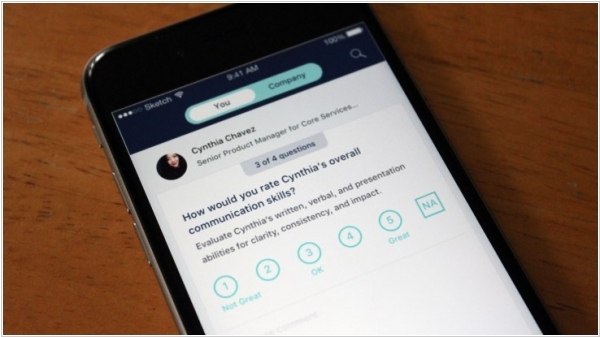 The first new tool is a way for HR managers and employers to keep ahead of compliance requirements for their employees. For example, that might be flagging when an employee hasn’t submitted their required paperwork after accepting a job. This gives managers an overview of all the employees it needs to get in check in order to ensure that they are compliant with all regulations. The second is a documents-management application that gives HR managers a way to track all the documents that employees have to submit for their employers. The goal there isn’t to just offer file storage like a Box or a Dropbox. Zenefits’ documents app instead focuses on the metadata of those documents and tries to ensure that everything is signed and in a file somewhere. HR managers can upload documents on their own or request (or bug) employees to get their documents in on time. 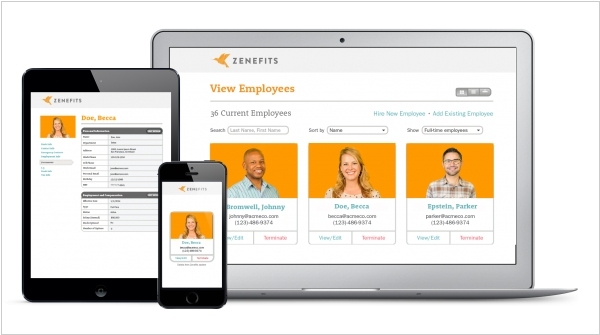 Online HR service that provides a single place to manage payroll, benefits, compliance, - Zenefits is launching its second version - Z2. The second incarnation of Zenefits isn’t just designed to be a home base for company data, but also a service that other companies can tap into in order to use that data for their own tools. Zenefits today is opening itself up to third-party developers, which can treat Zenefits as a permanent record for employee data — like some services treat Facebook for user data — and build their services around that. 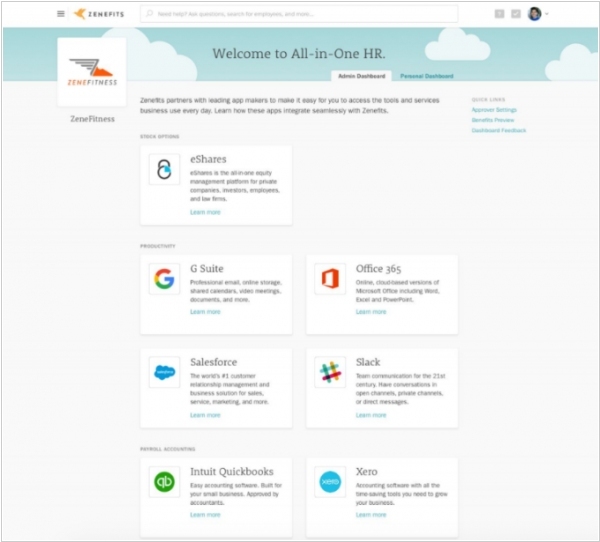 Cloud-based HR service Zenefits has launched its own payroll system (after paycheck services giant ADP cut the company off earlier this year). Zenefits also partnered with another service - ZenPayroll, but it switched its moniker to Gusto in September and rolled out a bunch of free HR services that looked very similar to Zenefits. The new Zenefits payroll system runs in two modes. One is free, fully automated service integrating automatic payments with any updates and changes to employee deductions for health, retirement, and other benefits. There’s also a pro mode for those who like to tinker a bit on the backend. Zenefits Payroll Pro starts at $25 per month, plus $4 per employee per month on an annual contract. The new system will also integrate with Quickbooks and Xero.